This family of peptidases contains a zinc metallopeptidase motif (HEXXHX(8,28)E) and possesses mucinase activity PMID:22299034. 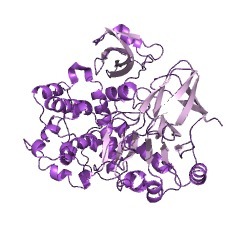 The peptidase family M60 domain belongs to the Merops zincin superfamily of zinc-requiring metalloproteases (clan MA, subclan MA(E)). The peptidase family M60 domain contains the metal-binding consensus motif HExxH. The two histidine residues are ligands of the catalytic Zn(2+) and the glutamic acid residue is involved in nucleophilic attack. An additional conserved glutamic acid is found approximately 20 residues from the first histidine within the metal- binding motif. The second conserved glutamic acid potentially acts as a third proteous Zn(2+) ligand. The peptidase family M60 domain targets complex host glycoproteins, such as mucins [(PUBMED:9343163), (PUBMED:16081094), (PUBMED:16790012), (PUBMED:22238230), (PUBMED:22299034)]. Baculovirus viral enhancing factor (VEF), also known as Enhancin, a metalloprotease that enhances viral infection by degrading the peritrophic membrane (PM) of the insect midgut. There are 4053 M60-like domains in 4048 proteins in SMART's nrdb database. Taxonomic distribution of proteins containing M60-like domain. This tree includes only several representative species. The complete taxonomic breakdown of all proteins with M60-like domain is also avaliable. Click on the protein counts, or double click on taxonomic names to display all proteins containing M60-like domain in the selected taxonomic class. 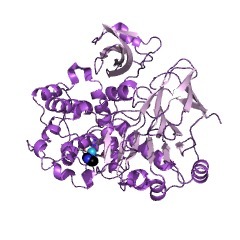 4fca The crystal structure of a functionally unknown conserved protein from Bacillus anthracis str. Ames.